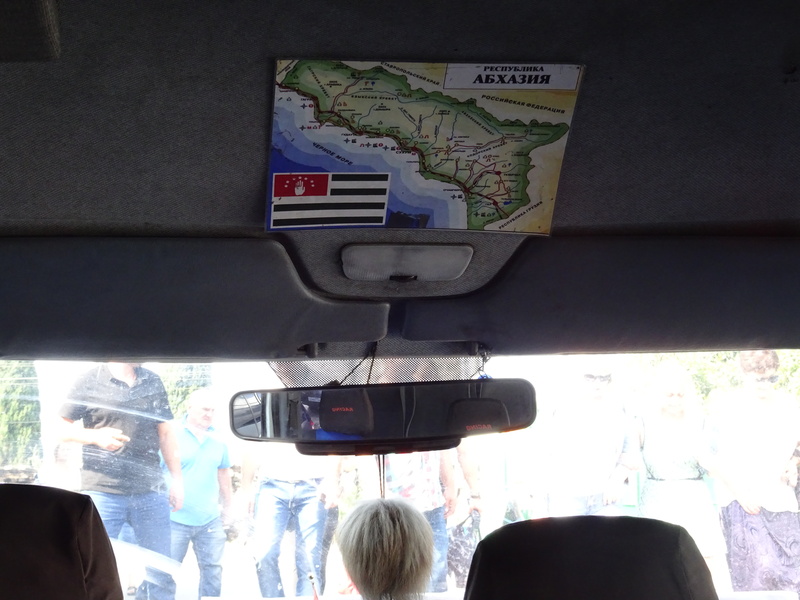 What is it like to enter and exit Abkhazia? I haven’t aimed to make this blog a source of practical advice, but I’ve had several comments and requests about this border crossing; and when I travelled to Abkhazia, I would have found this useful, hence this blog. I visited Abkhazia at the end of August 2017 on a round trip from Russia. Me on the beach of Sukhumi, capital of Abkhazia. The first step, which needs to be done a few days before departure, is to apply for a visa. There’s nothing tricky about this procedure, it just needs to be done, you need to fill in this online application form. For the dates you plan to travel, aim a bit larger, you’ll see later why. You will receive within a few days a letter via email from midraconsul@mail.ru. Note the email address which is hosted in Russia; funny isn’t it for a country that claims to be independent? 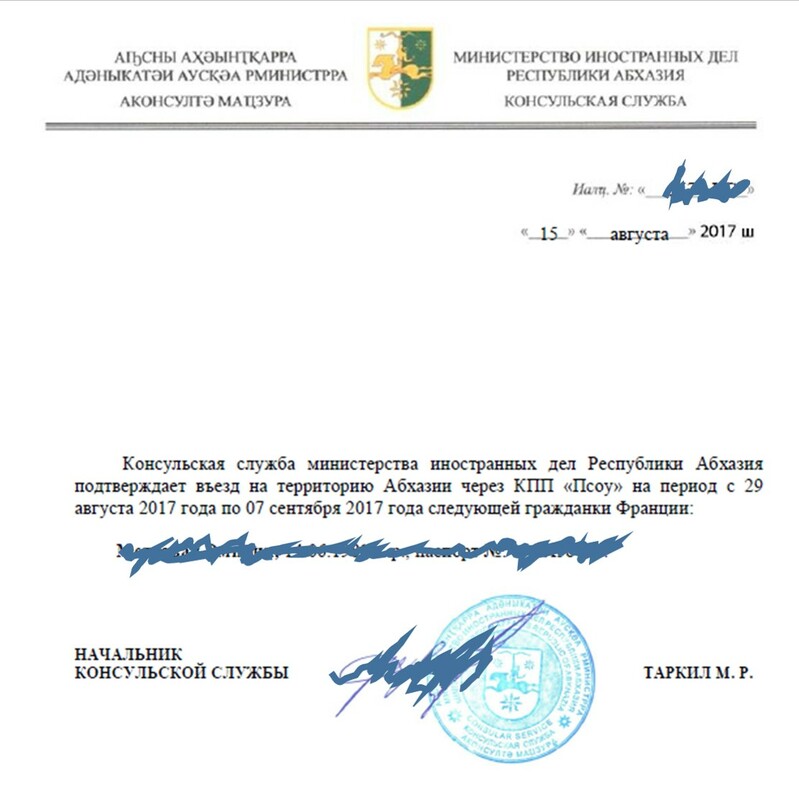 The document I received via email and had to present once in Abkhazia, bilingual Abkhaz and Russian. You must print the email’s attachment before visiting Abkhazia. It is not a visa, just an authorization to get a visa which you must get, once in Abkhazia. I travelled by train from Adler in Russia to Gagra in Abkhazia, because I like travelling by train and it seemed easy enough. It was just a simple train ticket to get at the Adler train station from the regular Russian railways RZD. Note that there was only one train a day, so best is to visit the station the day before and check the timetable; our train was early morning and we had to check-in in a separate area of the brand new and shiny Adler train station. The Adler-Gagra train is a standard old kupe Russian train with only Russian staff on board. 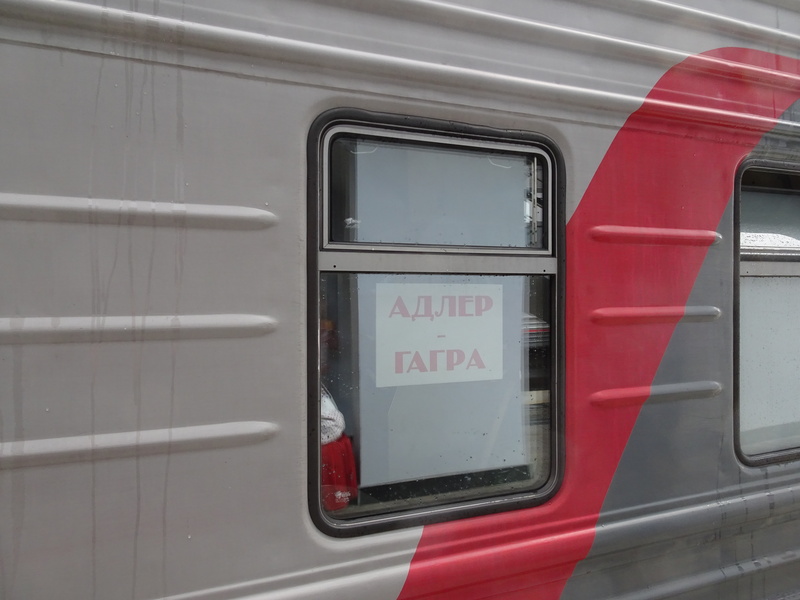 When the train reaches the border, everyone has to get out for the exiting procedure of the Russian Federation. Here it becomes interesting, as the Russian authorities inspect your passport just like any other exit, but they won’t stamp it. Interesting; because despite not having stamped your passport, you are actually marked in the systems as having left Russia, and you will need a new visa entry to be able to come back (so make sure you have a double or multiple entry Russian visa). There are no entry border checks for Abkhazia; in fact, only the Russian border is marked. The train stops in Gagra, from where it is very easy to reach Sukhumi, unlike taxi drivers tell you. Just leave the station and reach the main road (you may want to walk a little further into town) and stop any van (marshrutka) you find. In our first Abkhaz marshrutka that took us from Gagra to Sukhumi. When you arrive in Sukhumi, you must go visit the administration at Sakharova 33 to turn your printed email into a proper visa. Note that this procedure does not apply to Russian citizens, only to foreign visitors (in case you were still convinced that Abkhazia is really independent from Russia). You don’t need to do this immediately on arrival, you just need to make sure you do it before you intent to leave Abkhazia. But this can be the trickiest part. 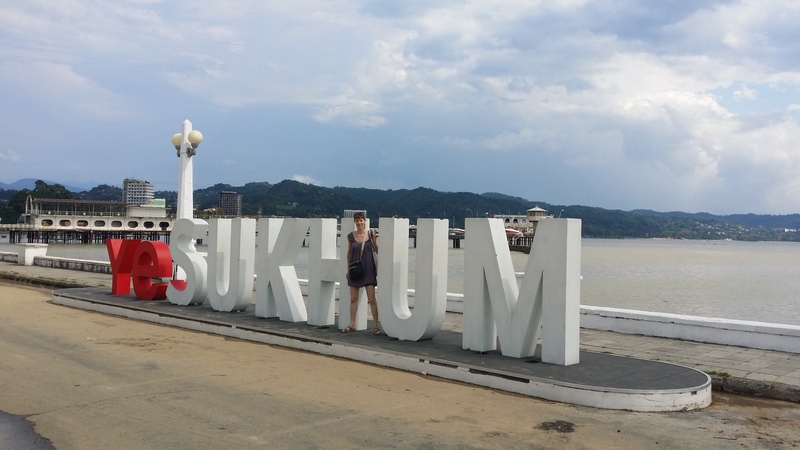 When we arrived in Sukhumi, we decided to go immediately. This way the hassle would be out of the way and we could enjoy the rest of our stay. Unfortunately the office was closed. It was a Monday; but people told us it was a holiday. When we returned the next day, it was apparently a holiday too. None was sure which holiday or why, but the office remained surely closed. We met two Canadian travelers who had arrived in Abkhazia the Friday before; and after now 5 days in, were desperately to get their visa to be able to leave. So be aware that this procedure might be causing delays in your travels; and if you’re on a schedule it is best (but not guaranteed) to arrive on weekdays. Finally the Wednesday morning at 9 am, the office was opened. There was a queue for Abkhaz citizens, one for Georgian citizens, and one for ‘foreigners’. Albeit, these 3 nationalities were reporting to a different person, and the queue itself was rather disorganized and chaotic, but in the end everyone got through it. When it was my turn, I just handed over the printed email and the equivalent of 5 dollars in Russian rubles. Someone had not printed his email and this created all sorts of problems, so do make sure you print yours. In exchange for the email and the 5 dollars, I received a loose visa (not applied in the passport) and a smile. Welcome in Abkhazia! Leaving the country was as easy as entering, especially since there is no border control indeed at the Abkhazian side (in case by that time you were still convinced that Abkhazia is independent from Russia). The Gagra train station. 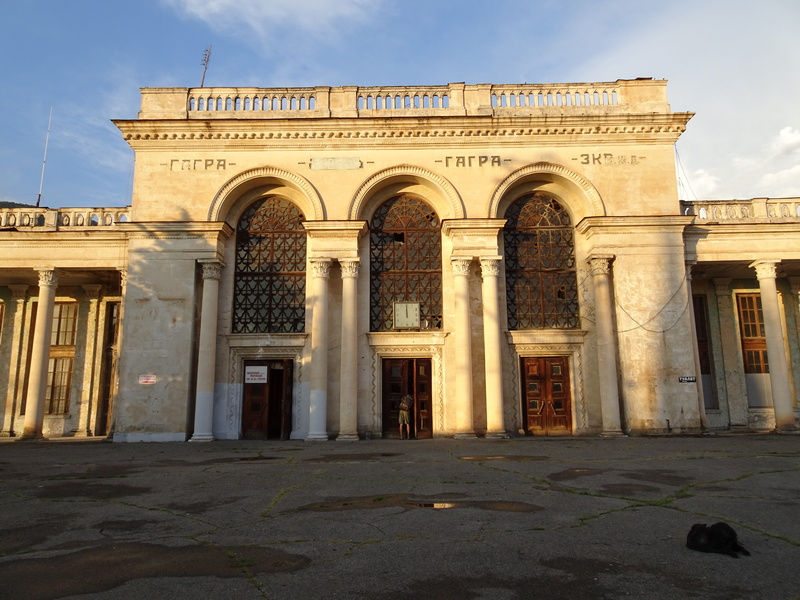 It has the feel of an exotically old Soviet-times Black Sea resort (like Yalta or Sochi), but rather abandoned. I took the Gagra-Adler train again, which this time leaves late afternoon from Gagra, and stops at the Russian border for the standard entry procedure. So, you see: easy and not much to worry about; probably much less hassle than entering from Georgia although I haven’t done it so can’t comment on it. Enjoy Abkhazia!